The fourteenth episode of a short series on games I discovered at EGX Rezzed 2019. 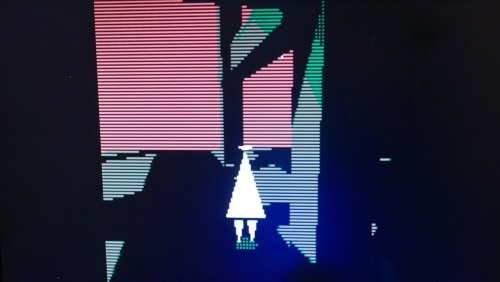 The very second game I played at Rezzed was Nth Dimension[al] Hiking by Zachariah Chandler. Nth Dimension[al] Hiking is quite forward about being a discoverable systems/exploration game and that it wasn't for everyone - although I would stress there really isn't "a game for everyone". It has a curious pixellated look with chunky scan lines, resembling the old Freescape games from the late 80s, although I'll note the player-character is not subject to scan lines, helping it stand out from the environment. I got nowhere. Maybe it wasn't for me. I tried to escape the bus stop at the beginning but no dice. The only achievement I did have was catching a bus. And then the game ended. I had a feeling I wouldn't write about it, despite it looking like the kind of thing I dig. And I walked away from the game. It was done. Later, I saw someone playing it who had made more progress than I. They were... flying? How were they doing that? Of course, I had to go back for a second go. The mistake I had made was to assume this walking simulator-type game only used the button A; in fact, other buttons on the Xbox controller were critical to make progress. Once I expanded my mind to include other buttons, the game began to open up to me. Then I got stuck again after I'd hopped across a couple of floating islands. And I walked away from the game. It was done. And then the unthinkable happened. Something which has never happened before and will never happen again at Rezzed. I went back to play the game a third time. I broke through my second impasse and managed to reach the much larger, and more beguiling structures. My guess is that the structures are simple in design but the scan line/dithered look painted in hard shadows makes the world feel far more unknowable, almost alien. However, Hiking doesn't feel hostile or threatening like, say, NaissanceE (Limasse Five, 2014), despite having similar problems with navigation and putting the player at some distance from the action. It's an odd little thing which is still in development. A preview build can be obtained on itch.io for Windows, Mac and Linux.